First of all, I have to say thank you so much Shay Bocks at Dumplin Design Studio for this fabulous new template for my blog! Shay is one of those awesome women who is balancing a career as a web designer with being a mom. If anyone is reading this blog and looking for a 'new look' for their own website, check Shay's studio out. And even if you're not, for a truly 'I can't click my mouse fast enough' read, check out her story on her own blog about giving birth to her second son. Let's just say that it tops the story of my own birth, as described by my mother--and I was over 9 pounds, 17 days late--in sweltering July. Shay's story also involves hot wings. 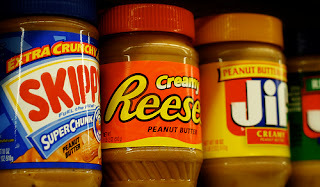 My life's peanut butter obsession has remained constant despite--or perhaps because of--the fact that I've never had a normal peanut butter and jelly sandwich. My mother did not believe in white bread, so she made my pbjs with Skippy creamy, using grape or (to be very daring) strawberry or blueberry jam on rye, seeded bread. 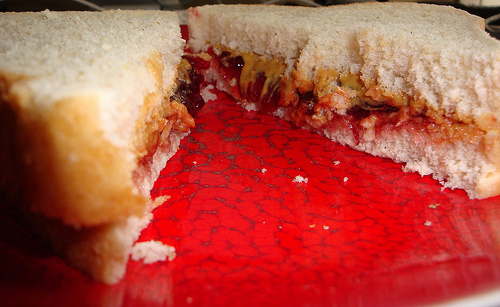 If she hadn't used Smucker's jam her pairing of an intensely bitter bread with this American classic might be considered daring. However, my reaction to this sandwich was predictable. I'd take a bite, grimace at the mouthful of seeds (when she used seeded strawberry jam, the paucity of peanut butter was particularly noticeable) and deposit my entire lunch in the trash basket. I'd take a longing look at Katy Ash's perfect half of a white Wonder Bread, Jiff, and grape jelly concoction, and then buy some ice cream. 1. Preheat the oven to 350F. Butter and line a 9X9 or 8X8 square pan with parchment. 2. Cream the butter and brown sugar. Add the vanilla, egg, and peanut butter. 3. Sift the oat flour, baking powder, and salt, and slowly incorporate the dry ingredients into the wet. 4. Spread 2/3 of the mixture into the pan, top with the fruit spread, and then 'dollop' the rest of the dough over the jam. Ina notes that not all of the remaining mixture will cover the jam--the effect will be more like that of a 'crumble' than a perfect covering. 5. Sprinkle the peanuts on top. 6. Bake for 45 minutes until golden. Cool for several hours, then chill the bars overnight if using the oat flour. These bars will be slightly more crumbly than bars made with wheat flour, so I strongly advise chilling overnight before serving to 'set' if you're not using wheat flour. Chilling will also make the natural fruit preserves less runny.